It is my pleasure to congratulate your Excellency on your election as President of the seventieth session of the General Assembly, and to affirm that the United Arab Emirates stands ready to provide the fullest support during your presidency. This year’s session is of particular significance as it marks the seventieth anniversary of the United Nations and the commencement of a new chapter that builds on the achievements of the MDGs through the adoption of the 2030 Sustainable Development Agenda by Heads of State and Government. The UAE welcomes this ambitious Agenda and believes that it will transform the world over the next 15 years. Despite the progress made over the past seven decades, the United Nations must now play a greater role in addressing the grave security challenges that risk threatening its achievements. The challenges facing the Middle East today, particularly extremism, terrorism, interference in the internal affairs of States and non-respect for the sovereignty of States, demonstrate that this Organization has not yet fulfilled its primary objective of maintaining international peace and security. Therefore, it is incumbent on all of us as members of this Organization to be committed to the principles of the United Nations’ Charter, most importantly its principles of sovereignty and non-interference, the promotion of dialogue and moderation, and playing an active and responsible role with regard to regional and international issues, if we indeed want to overcome these challenges. In this context, the UAE is deeply concerned by the escalating tension and violence in our region resulting from the terrorist acts committed by elements deliberately aiming at destabilizing the region and undermining its security. Since the Second World War, the world has not witnessed such an escalation in brutal and shocking terrorist crimes carried out by extremist organizations, most notably Daesh, Al-Qaeda, Hezbollah, Ansar-Allah, and other groups, who exploit religion for political purposes. The UAE condemns the brutal methods used by these groups and organizations in the name of Islam. They have no connection with the tolerant teachings of Islam, which calls for peaceful coexistence and acceptance of others. The brutality of these organizations has recently intensified in the region and includes destructive tactics aimed at controlling targeted groups, especially youth, who are brainwashed and incited through social media and remotely directed to perpetrate terrorist attacks, proving that the threat of these terrorist organizations transcends geographical boundaries and is a risk not only for our region but for all states and communities..
After five years of conflict and chaos, the regional forces have joined efforts to help restore security and stability in the region and help affected countries to confront these threats and to protect their people. The UAE has played an effective role in these regional efforts and positively engaged in maintaining peace and stability through political, security, humanitarian and development mechanisms. Our principled position to stand by the Government and the People of the Arab Republic of Egypt is based on our firm belief that the stability and prosperity of Egypt reinforces the stability of our region. The recent political and economic achievements of the Government of Egypt are major steps towards its recovery, and positively assist the recovery and stability of the region and restore Egypt’s pivotal and historic role in the region. We are confident in Egypt’s ability to overcome existing challenges. In this context, the UAE commends Al-Azhar institution for its longstanding tradition in confronting extremist ideologies, recognizes the vital role of its scholars in renewing the religious discourse, and calls upon the international community to provide Egypt with the fullest support in its fight against extremism and terrorism. My country’s participation in the Coalition supporting the legitimate government of Yemen is in response to the request by the President of Yemen to provide the necessary support to the government and the people of Yemen in confronting the Houthis’ coup, and combating other terrorist organizations such as Al-Qaeda in the Arabian Peninsula and Daesh which have exploited the chaotic and unstable conditions in Yemen and increased their terrorist acts. We seek, with the international community, to restore the political process in Yemen in accordance with the agreed parameters, most importantly the GCC initiative and its implementation mechanism. To achieve this goal, it is important to ensure full compliance with the Security Council resolution 2216, which was adopted after consultations with relevant states in the region. This process underscores the importance of improving the working methods of the Security Council by involving affected States and regional organizations in accordance with Chapter VIII of the UN Charter, in the collective decision-making process of drafting resolutions. This will enhance the effectiveness of the Organization, and will contribute to significantly improving the implementation of UN resolutions and prevention of conflicts. The UAE commends the Special Envoy of the Secretary General for Yemen for his efforts. The UAE affirms its continued support for the Arab coalition led by the Kingdom of Saudi Arabia and its commitment to enhancing the capacity of the Yemeni people to restore stability. We regard the liberation of Aden from the Houthis’ rebels a military and a humanitarian victory, with Aden now the logistical base for delivering vital humanitarian aid to the Yemeni people. Aden’s liberation has facilitated improvements in the delivery of humanitarian assistance and helped to alleviate the situation. The UAE is committed to supporting humanitarian efforts in Yemen. Total UAE humanitarian assistance extended to Yemen during the past four months has exceeded two hundred million dollars. We will continue working with the United Nations to deliver aid to meet the humanitarian emergency needs of the Yemeni people. We also regard the restoration of full control of Bab Al-Mandab by the coalition forces and the Yemeni people yesterday and defeating the rebels, as another military success in securing this vital sea lane. It further marks the end of the control of the rebels and their supporters, while demonstrating their weakening presence in other strategic areas in Yemen. The UAE expresses its deep concern regarding the ongoing tension and instability in Libya, which represent a major threat to security and stability in the region. The UAE stresses the need to lift the ban imposed on the capabilities of the elected Libyan Government to enable it to fight Daesh and other terrorist organizations and respond to trans-boundary threats. The UAE is increasingly concerned about the inability of the international community to reach a political settlement to the Syrian crisis and put an end to the violence and systematic mass atrocities committed by the Syrian regime against its own people, which have resulted in the displacement of millions of Syrians and the destruction of their properties. The crisis has also created serious humanitarian consequences, which have affected neighboring countries and led to a political and security vacuum exploited by terrorist organizations, especially Daesh and Al-Nusra Front, which have spread their extremist ideas and destructive messages in the region. Therefore, the Security Council must fulfill its principal mandate and reach a consensus on a settlement for the Syrian crisis to ensure a political transition and the formation of a new government, which encompasses all components of the Syrian society. We also stress the importance of the international community continuing to deliver humanitarian aid to the Syrian people. The UAE affirms its humanitarian commitment to supporting the Syrian people and alleviating their suffering. Since the beginning of the conflict, the UAE has received more than 100,000 Syrian nationals, and extended humanitarian and development assistance totaling more than US$ 530 million. The Syrian and Libyan crises and their associated shocking violence have taken a heavy human and political toll. Almost daily, we see the suffering of innocent people, especially women and children, in their mass exodus as they search for safe havens and safe livelihoods, and the heavy price paid by refugees who have lost their lives in tragic conditions. The barbaric acts of destruction committed by terrorist organizations against historical symbols and sites have also revealed the considerable loss caused to our human and cultural heritage. As it has done in Syria, Daesh has exploited the unstable conditions and sectarian practices to further hostilities and violence among the Iraqi factions and destroy Iraq’s historical and cultural heritage. The UAE continues to stand in solidarity with Iraq and supports international efforts aiming at combating this terrorist organization. We also support the efforts of the Iraqi government towards achieving peace and stability and ending sectarian practices, and stress in this context the importance of implementing reforms to ensure inclusiveness, fairness and equality for all segments and components of the Iraqi society. 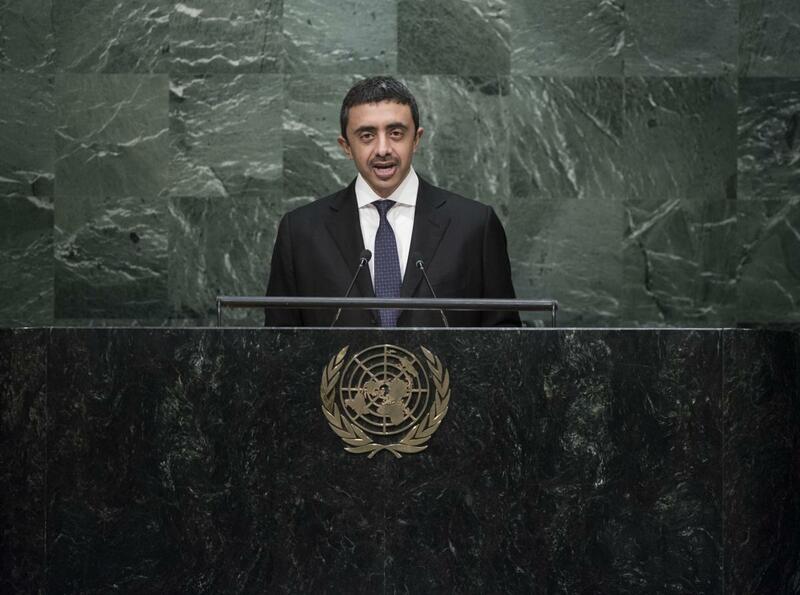 For its part, the UAE will continue supporting humanitarian aid programs to help the people affected by conflict. It has become evident that the salvation of our region lies in building inclusive nations free from any sectarian or religious affiliations used by parties for political purposes and led to chaos and bloodshed. The UAE is fully aware of the consequences of failing to take firm measures to prevent extremist and terrorist organizations from pursuing their destructive endeavors. The consequences of these failures have inspired radical groups globally especially in the Horn of Africa, to use similar methods and to exploit instability in their countries to attract supporters and followers. In this context, the UAE commends the efforts of the Somali Federal Authorities and its Forces in countering Al- Shabaab Movement and its threats, and we urge them to continue taking the necessary measures to restore peace and stability, and reiterate our support for such efforts to achieve that objective. Therefore, we stress the necessity of intensifying and unifying our efforts in order to combat the threats of these organizations wherever they are, and the need to address the root causes of radical ideologies before they turn into violent extremism. My country has been committed to supporting regional and international efforts aiming at combating extremism and terrorism through cooperation and coordination with regional and international partners, including the international coalition against Daesh and the Global Counter-terrorism Forum. The UAE also participated in establishing and hosting a number of international institutions countering extremism such as the Hedayah center to help the international community in building capacities and exchanging the best practices in countering all forms of extremism. The UAE host also the Muslim Council of Elders and the Global Forum for Promoting Peace in the Muslim Societies with a view to spreading a culture of tolerance and peace and promoting convergence between faiths. Recently, the UAE launched in cooperation with the United States, the Sawab Center with a view to countering the social media messaging of Daesh, and to allow moderate voices to reach the millions of people who reject terrorist practices and the misleading conceptions promoted by Daesh and other terrorist groups. The UAE believes that security and stability of the states of the region depend on the extent of their positive cooperation, which must take as its fundamental pillar respect for sovereignty and non-interference in internal affairs. With regard to the statement by the President of Iran during this session’s general debate, I believe that Iran’s record does not qualify it to speak about the safety of the Hajj pilgrims and human rights, nor do its policies give it the right to refer to stability issues in the Arabian Gulf and the Middle East. The UAE stands firm with the Kingdom of Saudi Arabia against any Iranian attempts to interfere in the internal affairs of the Arab States. In this regard, I reiterate the United Arab Emirates rejection of Iran’s continued occupation of the UAE three islands Greater Tunb, Lesser Tunb and Abu Musa, and demand restoration of the UAE full sovereignty over these islands. We also stress that all actions and measures carried out by the Iranian authorities are contrary to international law and all norms and common values. From this platform, we renew our call to the international community to urge Iran to respond to the sincere and peaceful calls of the UAE to reach a just settlement for this issue, either through serious direct negotiations between our two countries or by referring the issue to the International Court of Justice. Despite all these challenges, the Palestinian issue remains at the core of conflict in our region, and one of the main threats to its security and stability. Moreover, the feelings of injustice and frustration resulting from the continued Israeli occupation of the Palestinian territories and the flagrant human rights violations committed by the occupation forces, provide extremist groups with an opportunity to exploit these serious humanitarian conditions and to spread their radical thinking and incite frustrated youth to implement their destructive agenda. We call upon the international community to seize the opportunity of the 70th anniversary of the United Nations to create effective international partnerships built on solidarity and a genuine desire to develop our countries and achieve security and prosperity.